Sterling silver and hand-etched details are sure to grab attention when you slip on this hand-etched silver spiral wedding ring from Apples of Gold Jewelry. 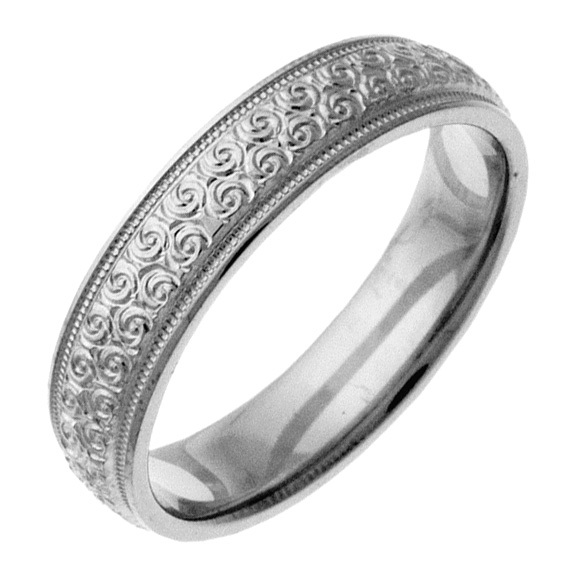 Tiny spirals, which almost look floral in design, are etched by hand into a .925 sterling silver wedding band, making it appealing to both men and women, depending on the ring size needed. Shown here in 5mm in width, it is also available in varying widths, from 5mm up to 8mm. The intricate details of this ring make it easy to fall in love with, and the comfort fit design make it easy to wear! We guarantee our Hand-Etched Silver Spiral Wedding Ring to be high quality, authentic jewelry, as described above.